By Noelle Viger - News Editor · January 25th, 2019 at 4:25 p.m. Updated information regarding the timeline and frequency of harassment on campus. On Thursday, January 24 an email was sent out to all students and faculty at UBCO informing them of a suspicious individual on campus. Campus Security stated in the email that an individual has been “approaching women, engaging in harassing behavior, and making inappropriate and suggestive comments.” This individual was described in the email as “a Caucasian male, 28 years old, 5’11, slim build, shoulder length sandy blonde hair and a full beard.” Campus Security has been working with the RCMP and issued a no trespassing order for this individual. Bud Mortenson, Director of University Relations, stated that this no trespassing order was issued for the individual at the end of December. However, this past week there have been “six different student reports” of being approached by the man identified in the email. These students reported the harassment to the Sexual Violence Prevention and Response Office (SVPRO). The SVPRO approached Security to create an email alert to inform students and faculty on campus. This email broadcast is the first broadcast of its nature. If this individual returns to campus, Security asks that students call 911 immediately. The RCMP have been working closely with Campus Security, and the RCMP is currently investigating this individual. Mortenson stated that student emails are typically only used for academic information. However, in this instance, the University decided that it was more prudent to send an email directly to all students to inform them of the situation and give them contact information than simply release a statement. According to Mortenson, the decision to send out the email was made late in the day on Wednesday, and by Thursday afternoon all of the approvals needed for an email broadcast were obtained. Mortenson recommends for all students to download the UBC Safe App, as it has quick access for resources and phone numbers. The app has the numbers for Campus Security and the police, along with SafeWalk. 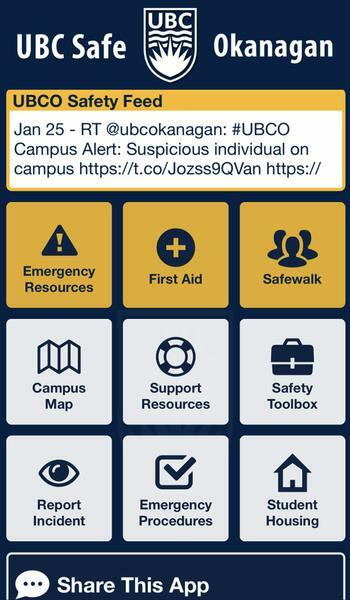 The app also displays notifications from the UBC Okanagan Campus Security Twitter in order to quickly inform students in the event of suspicious activity or related concerns.